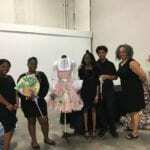 CTE Apparel students got a wonderful opportunity to participate in the 2018 Charlotte Fashion Week September 27-29th. Students from Butler, Mallard Creek, Hough, and West Charlotte were all invited backstage to experience hands-on what it takes to be in the fashion industry and all the creativity, effort and precision it takes to create a spectacular fashion show. 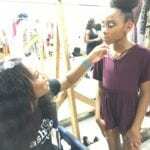 Students worked along with fashion designers, hair and make-up artists, event planners and fashion show directors. 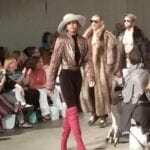 This was truly a lifetime experience for these fashion design pathway students! Hough student Asheleigh Shuford got an opportunity to be one of the 200+ models to participate in both Friday and Saturday evening runway shows. Charlotte Fashion Seen Event Planners selected three recyclable design dress by West Charlotte to showcase Friday evening at the Emerging and Recyclable Designer Runway show. This was a truly a great experience for our CTE apparel students and an opportunity to showcase and promote themselves as aspiring designers! !